A Happy Song: Which Red? We are getting our house ready to list in the next few weeks (sorry if this is a surprise to my friends and neighbors that may read this). We are sprucing things up and could use some help picking a front door color. Here is our unassuming brick house in a quiet, tree-lined neighborhood. We'll be adding shutters back and painting them to match the trim. We'll also be planting some spring flowers. Do you have any other red suggestions for this color brick? Is it a mistake to go with red? We'll be painting the door either this weekend or next and I'll post the before and after photos when it's complete. My vote is for the Glidden Red Delicious. I think you see to many doors in the Ruby Red. I like the Red Delicious best. Just my two cents. Happy Painting whatever color you choose! I am putting my house up on the market next week myself so I understand!! I think Glidden Red also. The one is too muted, the other is too loud... the Glidden seems to be the best option. Definitely! You should post your results back here to show us all the plants and the new door color so we can see it :)))) I want to see. I would also say stay away from red as there is enough red with the brick! White or something else that will make the door stand out. Good luck ...we are going to be getting parents house ready for market too. I agree with Krystal and say white. If red, I would choose ruby red as the others seem too pink to me. I am sure you will do a great job whatever. Look forward to seeing your 'after' pics! I LOVE red! We have a brick red colored roof on our house :) Would definitely go with the Glidden Red. I like the grey blue idea for subtle contrast. I agree with some of the others... either white or a subtle blue. Good luck with selling your house!! I'm going to go against everyone and say black! It will make it stand out against the red bricks. I think it's going to be too redish if you paint the door red.Mu opinion is good if you paint your door same as the house trim. 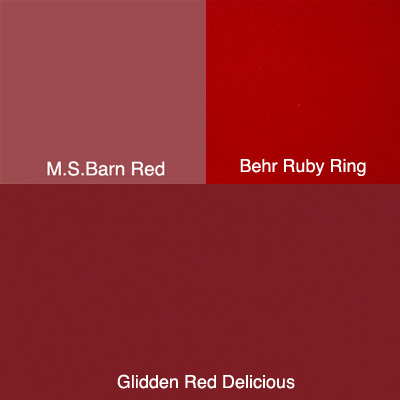 If you have to choose red, I'd say the Glidden Red Delicious. But I totally agree with the other girls- a shade of blue, green, or even black would look stunning on your house! I agree with Jill, no more red. It's a lovely house. Wish you the best on painting and selling. If you go with red, I like Glidden. But I also love the idea of an aqua blue or black. Your house is really cute! Though the reds are beautiful, I would be more likely to choose a forest green. Can't wait to see your finished project I'm sure whatever you choose it will be adorable! I'm with ByTheBook... Black! A nice shiny black would look beautiful! Or I like Ruby Ring, too. Red delicious too! Love that color! I'm against the red, I think it will blend too much with the bricks. I think you want the door to pop. Maybe a cream with a pretty wreath or a goldenrod yellow color? I think the red door won't stand out as much against the red bricks. I actually really like that golden-yellowish door you have. You should stick with something yellowish or blueish! I'd be more apt to choose a dark green, since it is complimentary to the red brick. But if you are sticking with red , go with the Red Delicious. Did it ever get painted? It did! The link for the before and after photos is at the end of the post.